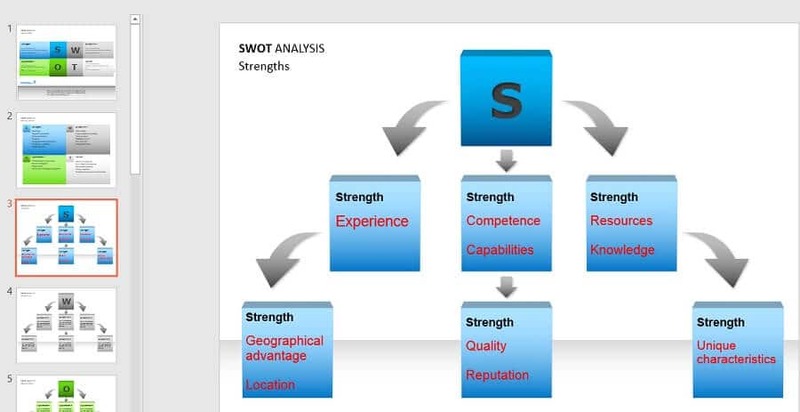 SWOT has been around as a strategic planning tool for more than half a century. 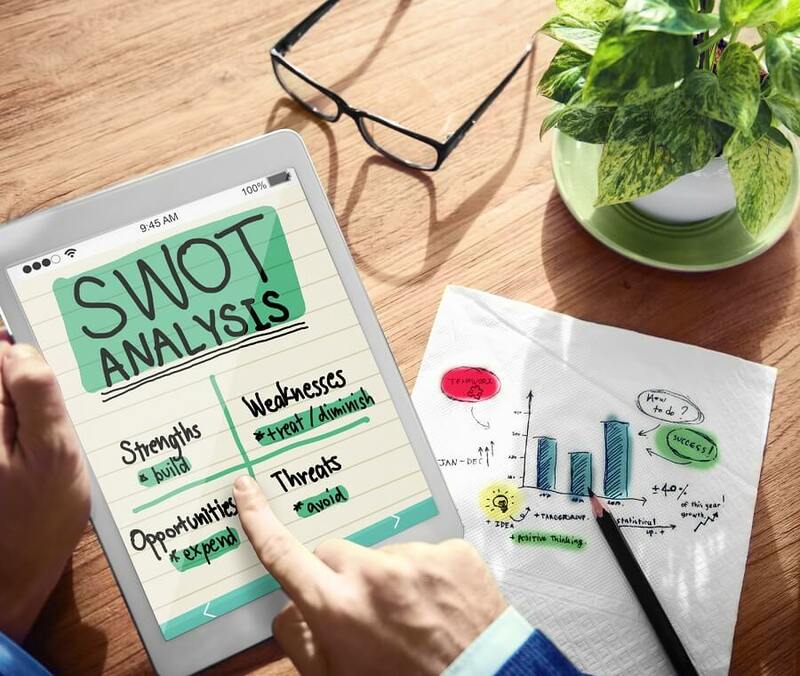 By now, the SWOT analysis template by which a business can map out its near future plans while evaluating external risks against internal factors has gained itself a legendary reputation. In this post not only do we explain how to make a SWOT analysis, we’ve also compiled a list of the best SWOT templates. 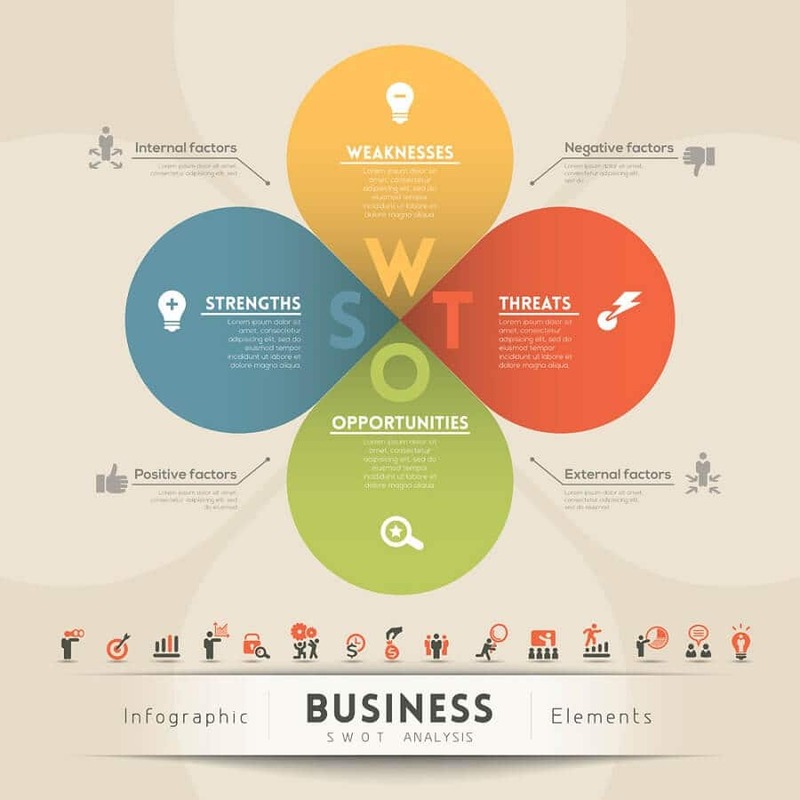 Devised by business masters Edmund P. Learned, C. Roland Christensen, Kenneth Andrews and William D. Book in their book “Business Policy, Text and Cases” in the 1960s, the SWOT method is akin to a business blueprint. It sketches the first steps a company or project should take prior to knocking at the door of fresh initiatives, new policies, radical changes, and renewed efforts. Drafting a SWOT takes the edge off venturing into the unknown of external and internal factors that might pose a threat to your endeavor. The degree to which these two environments -internal and external – respond to each other is known through the concept of strategic fit. On paper, strategic fit is expressed through a table split up into four columns to list Strengths, Weaknesses, Threats and Opportunities side-by-side for comparison. Identify the SWOTs – You must ask questions that will lead to meaningful information and revealing answers for each category – strengths, weaknesses, opportunities, and threats. Pit the SWOTs against each other – Selection and evaluation of the most important factors will give you an idea if the objective you’re trying to reach is reachable. Identify the relations between internal and external features – How do your strengths complement the opportunities? 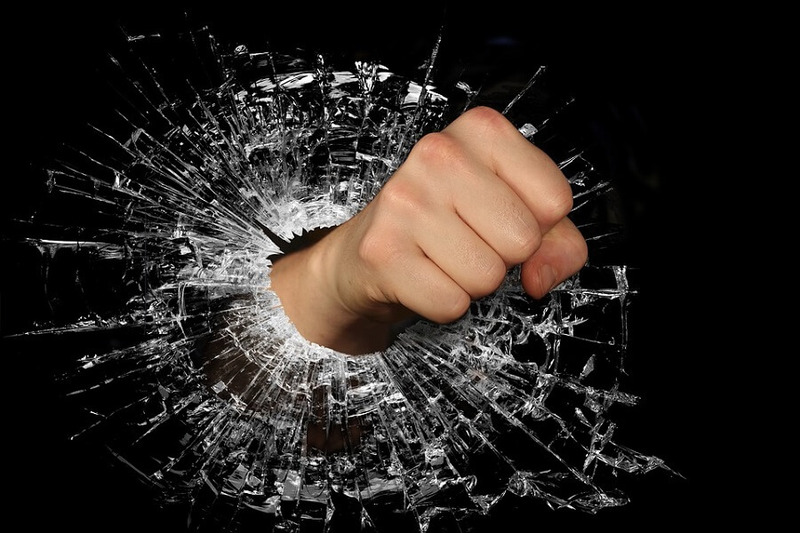 Could threats find fertile ground in your weaknesses? If so, maybe a defensive strategy is in order to ward off potential risks. Financial reserves – Sources of funding, income and investment opportunities. HR – Workforce: employees, volunteers, and interns. Space and location – A company’s facilities, equipment, market research capabilities. Current processes – Software systems, employee programs, etc. External forces could be exploited to the business’s advantage or negatively affect a company, project or individual. Unfortunately, these forces are beyond anyone’s control. Market trends – Be aware of the shifts in products and development in technologyand the potential impact on your business. Economic trends – These might be local, national or international financial changes. Demographics – Consider your target audience and its characteristics: age, gender, race, ethnicity, etc. Regulations – Social policies, legislature, political and environmental regulations. Once you tie relationships between these four factors and analyze them in dependence upon each other, it will help you decide which strategy to best implement for the desired outcome. 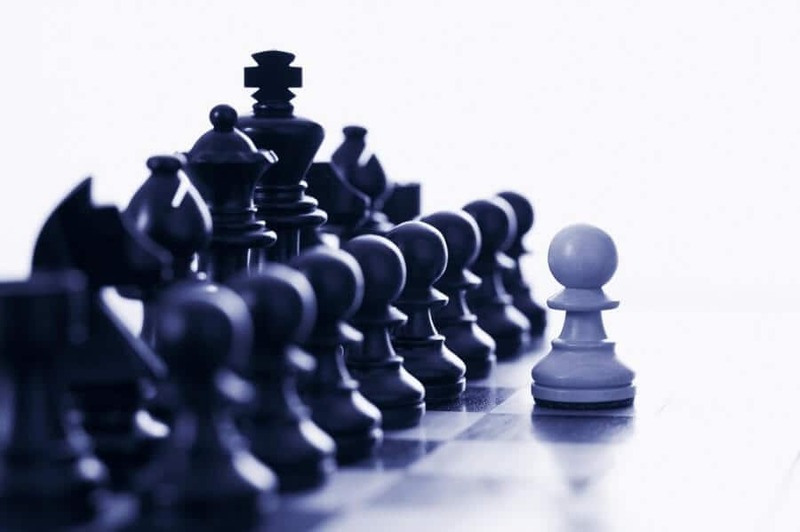 Matching strengths to opportunities, or converting weaknesses into strengths and threats into opportunities are the tactics to employ in order to get a competitive advantage. After all these years, PowerPoint is still the best tool for creating digital slide based presentations. It can also be your best friend when doing a SWOT analysis. PowerPoint presents an overture of designs and matrixes to suit any style – from the friendly and playful to the extremely formal, minimalistic design. Flat designs speak minimalist, elegant and tight design. They’ve been in fashion ever since the dawn of computers, practically. 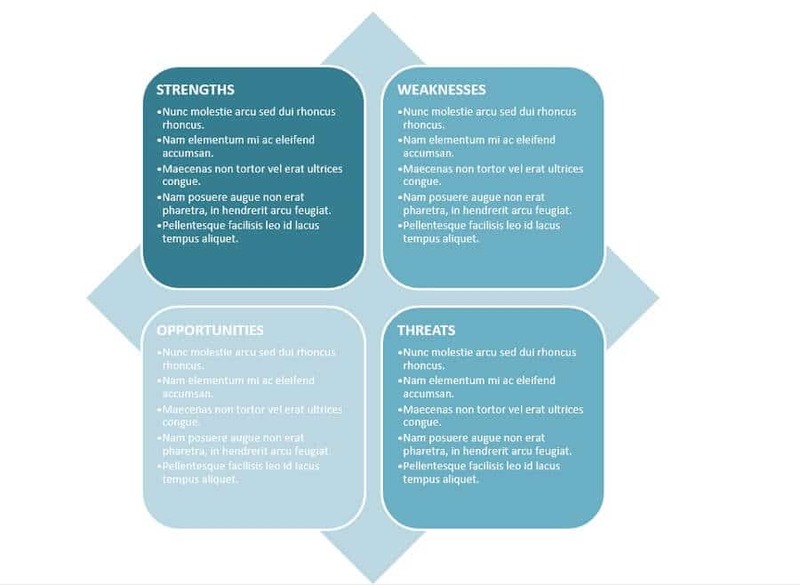 This SWOT template provides a beautiful flat layout with blue, green and gray slides that are separated into strengths, weaknesses, threats and opportunities. Like other templates in this list, this one can be customized to recolor, rearrange and resize the diaphragms according to your needs. If you feel creative and want to build a SWOT template from scratch, PowerPoint deals you the tools to do just that. Using SmartArt Graphics in PowerPoint gives you the freedom to switch between various layouts, shapes, and colors. You might save a lot of time by simply selecting an appropriate graphic via Insert->SmartArt. This is the perfect design for you if you love indulging in long lists. Just look at the space! While this might seem like a ridiculously simple layout, it actually offers room to stretch. Handy if you’re going for a detailed SWOT analysis. This template also offers precise information on what each SWOT category stands for. 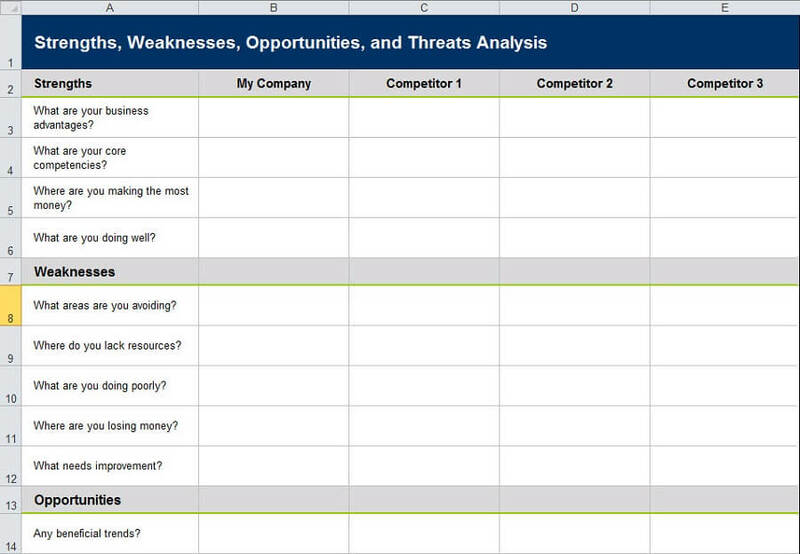 You’re on the lookout for the best SWOT analysis template and the choices are overwhelming. Surely, this template must be pointing in the right direction. Its horizontal arrows use simple, eye-catching colors, while the design of the matrix says classic, yet trendy. What this template has to show for itself are not one, but two geometrical figures to highlight the content. 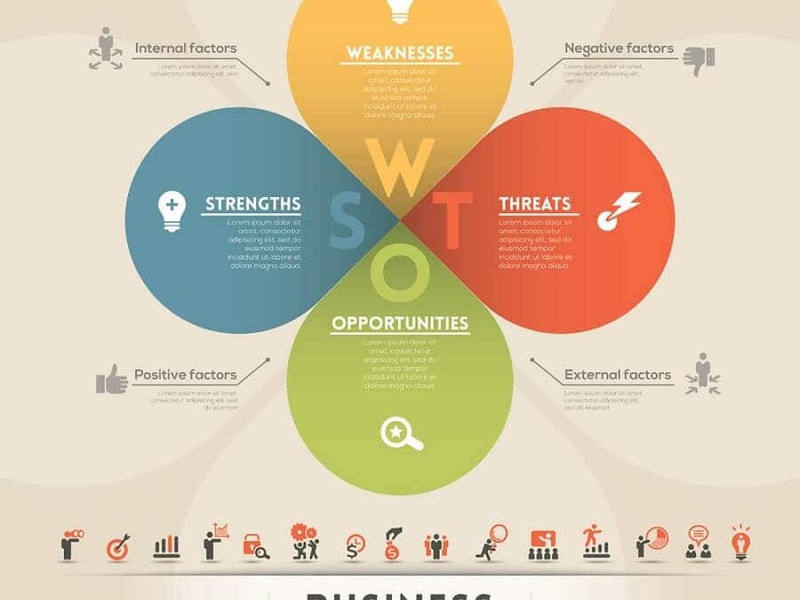 You have all the four components of a SWOT analysis in full view. Grid-shaped, this template is useful for beginners. 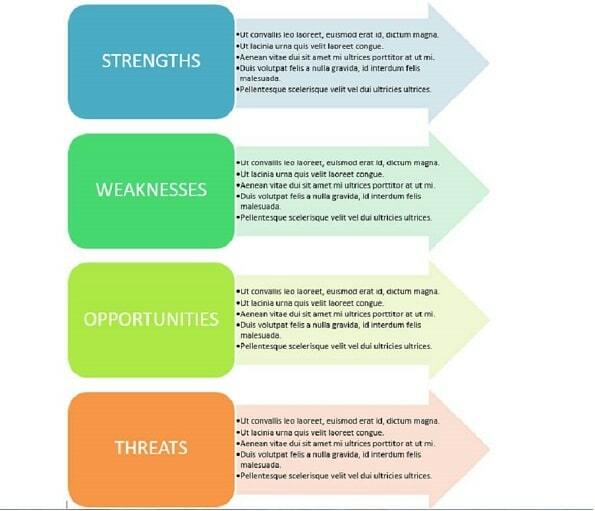 If you're still confused about the content to go in a SWOT analysis, the Excel SWOT analysis template will give you guidance. 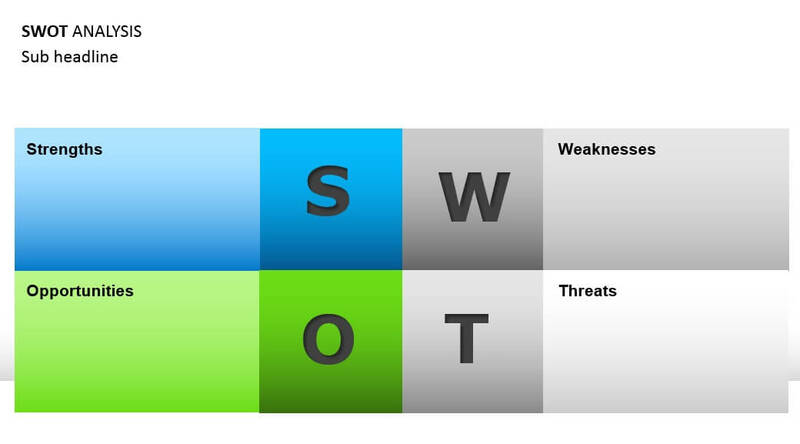 SWOT is a reputable tool of strategic planning. It balances external threats against internal weaknesses, while pairing strengths to opportunities in order to highlight a company's or an individual's future path. 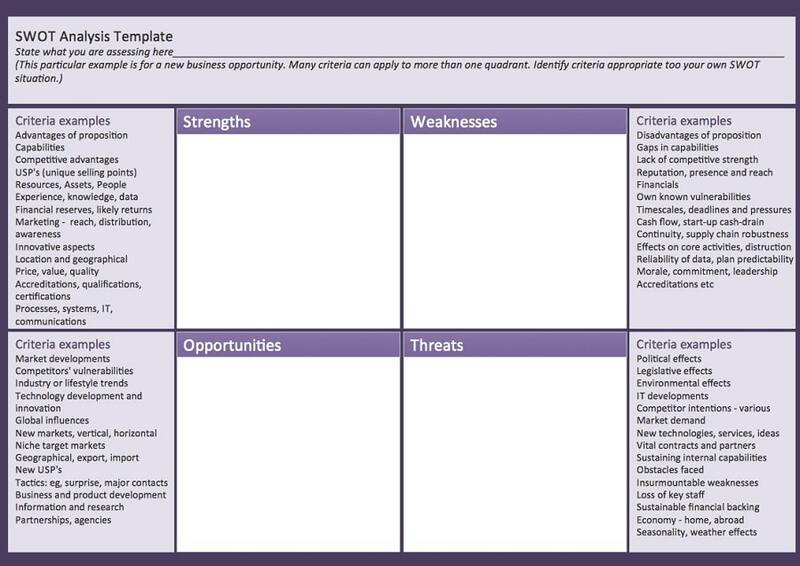 There's more than one SWOT analysis template out there. However, that doesn't mean you have to stray too far off from the classic layout. A simple design will do to take you on the right path. So that’s the case? Quite a reoilatevn that is.